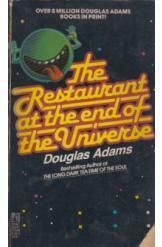 The Restaurant at the End of the Universe by Douglas Adams, Sci Fi. Book is in good condition, all pages intact. In the wake of their escape from the vogons, Arthur Dent, Trillion, Ford, and the others retreat to the Restaurant at the End of the Universe to catch their breaths. More zaniness and comic nihilism await! Book 2 of the Hitchhiker's Guide to the Galaxy series.